5 No-Cook Recipes To Help You Beat The Heat! Leave the stove for dead and beat the heat with these 5 delicious no-cook recipes. A full day of easy-to-prepare, high-protein meals is right here! It's hard get excited about cooking up a storm when it's hot enough outside to fry an egg on the sidewalk. You just want to reach for an ice pop, but that's not enough to sustain you. A sandwich or shake? Also pretty lackluster. Better to just veg out and order in, right? Wrong! With this full day's worth of easy recipes, you can give the stove the day off and still pump out dishes that will keep you and your muscles well-fed. After all, many fruits and vegetables are in peak season, making this an excellent time to hit up your local farmer's market or fruit stand. Embrace the joy of (not) cooking and make at least one day of this summer a breeze! 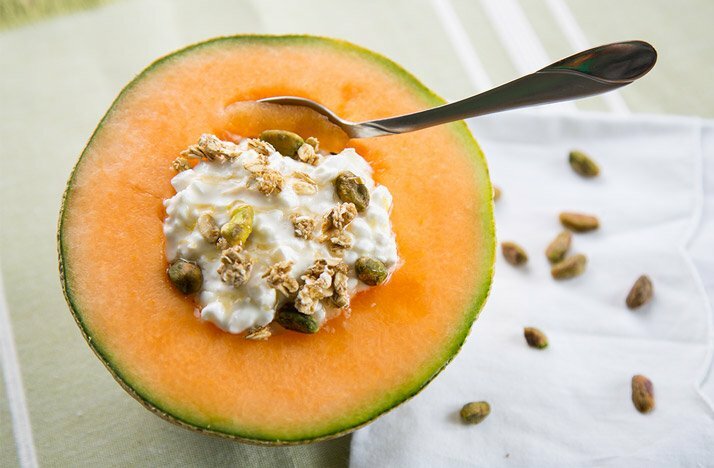 With this refreshing recipe in your back pocket, there's no need to settle for boxed cereal when you don't want to make a hot breakfast. Cottage cheese is a fuss-free way to kick-start your day with high-quality protein. And since they're made up of almost 90 percent water, edible cantaloupe bowls are a stealthy way to bolster your summer-hydration efforts. Make it better: Granola adds great crunch, but compare brands and look for those that contain the least amount of sugar per serving. A steamy bowl of soup is not something you probably crave when temperatures are soaring. 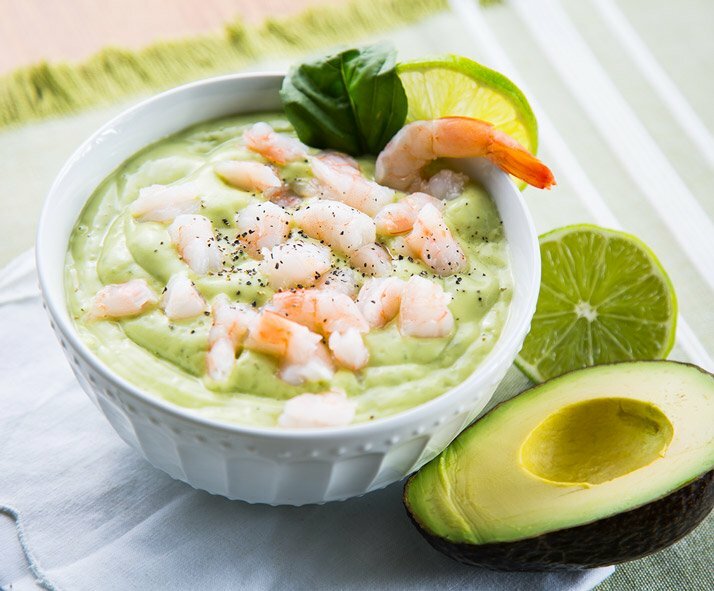 This chilled version will help you keep your cool and load up on the heart-healthy fats found in avocado. Ready to thaw at a moment's notice, bags of previously cooked frozen shrimp are a quick way to add a healthy dose of muscle-building protein in a flash. Make it better: Cold soups are best served in cold bowls. So plan ahead and chill your serving bowls in the refrigerator for about 30 minutes before you're ready to spoon up this soup. Here's proof that no-cook snacks can be so much more than just a bowl of yogurt or handful of nuts. Strips of zucchini are a fancy delivery method for ready-to-go smoked fish. Beyond being a top-notch protein provider, smoked swimmers like mackerel are a source of ultra-healthy omega-3 fatty acids. 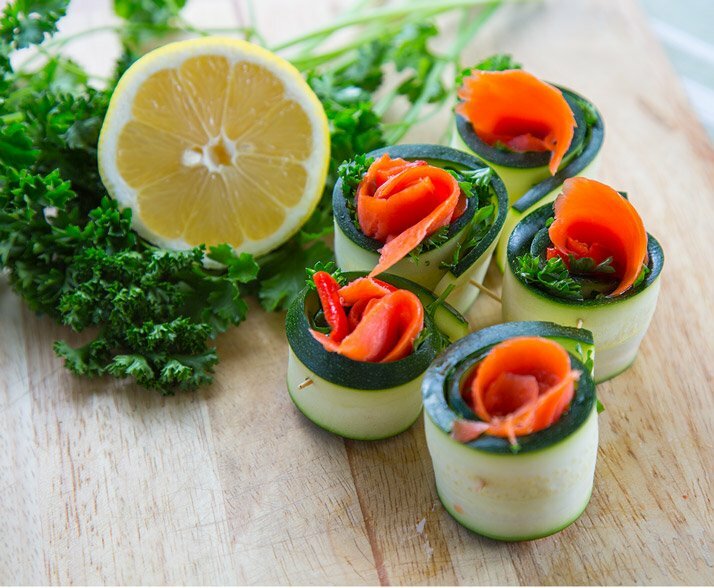 These bundles of great nutrition are also an inspired appetizer for summer backyard parties. Make it better: When a snack attack strikes, you may not have the patience to assemble this recipe. Good news: The rolls can be made up to three days in advance and kept chilled. Rustle up this salad in advance, and you'll be set up for a few cook-free dinners throughout the week. Supermarket rotisserie chicken lets someone else do all the cooking, while you get to benefit from a bounty of juicy protein. 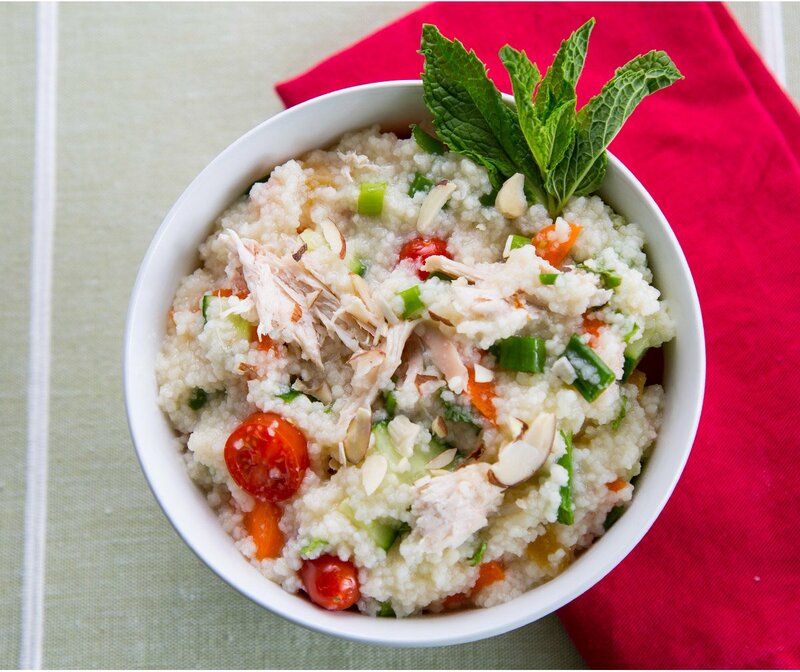 Unlike other grains such as rice and quinoa that require simmering time on the stove top, couscous needs only to soak in boiling water. Since the goal of the day is to stay away from the stove, use a tea kettle, or just pour the appropriate amount of water into a microwave-safe cup and cook for two minutes, or until water is boiled. Pour it over your couscous, and let it sit covered for at least 5 minutes. For a bigger nutritional bang for your buck, seek out whole-grain couscous. Make it better: You can score your bird from the megamart, but for optimal flavor and nutrition, take the time to source out your salad vegetables from a local farmers market. Dessert: Chocolate Banana "Ice Cream"
There's nothing like concluding a steamy summer day with a bowl of frosty ice cream. With frozen bananas for your creamy base and protein-packed Greek yogurt, this near-instant version won't blow up your physique, but it will deliver plenty of texture and taste! To freeze bananas for "ice cream" or smoothies, peel the fruit, slice it into chunks, and spread it out on a baking sheet. Place the bananas in the freezer until they're frozen solid, then transfer them to an airtight bag until you're ready to use them. 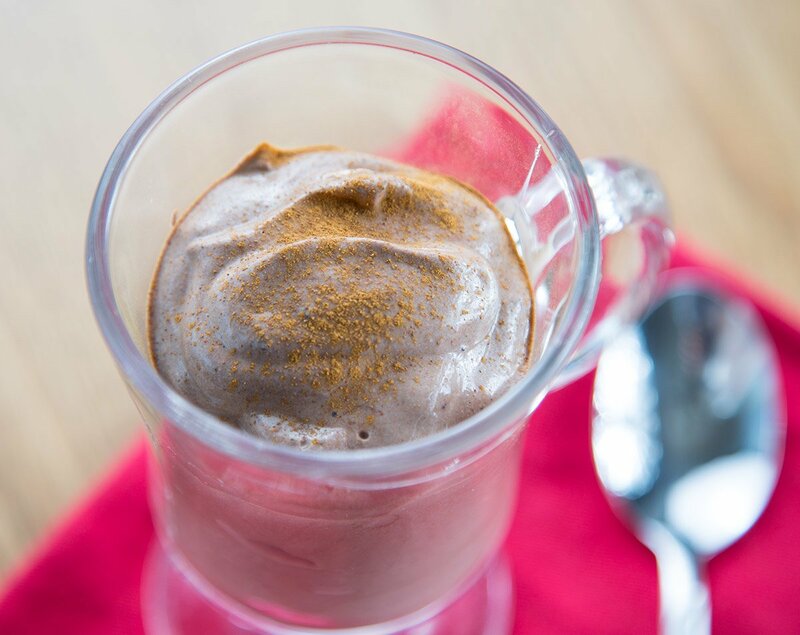 Make it better: To infuse this creamy treat with more antioxidant firepower, select cocoa labeled "natural" or "raw."